Edward Schlosser is a liberal professor, and his students terrify him. You know this, because the article he just wrote for Vox.com (no relation to Vox Day, for those playing along without a program) opens by saying so. He is afraid because there’s a different “vibe” in academia now. He’s afraid because now a man’s career can be ruined merely because he spent the entire career making academia a hostile, toxic place for women (or as he prosaically refers to it, “being creepy at conferences”). He’s afraid that claims of racial or gender insensitivity might be taken seriously in a way that, before this changed vibe, an obviously spurious complaint about reverse-racism was pointedly not. And the thing is, I don’t know. Specifics aside, I think he’s on to something about the problem of treating students as consumers and then adopting a “customer is always right” approach to teaching. This is a knife that cuts across ideological divides, as Professor Shannon Gibley was reprimanded in 2009 for making white students uncomfortable when teaching the truth about structural racism and imperialism. There’s something there. I’m not the best person to engage with what’s there, as I’m not an academic. But I’ve seen enough and heard enough to know that there’s something there. I don’t think the problem here is necessarily with the students, or with liberals, so much as it is with the commodification/consumerization of education as a whole. When college makes itself into a big business and positions its degrees as product, the student-as-consumer model seems like a necessary end result. It’s probably not quite that cut-and-dried, though, and this could be a fascinating discussion to have. The thing is, Edward Schlosser doesn’t seem to be having that conversation. Rather than asking what’s been changing over time in the environment in which he’s working, he’s looking outward. He’s blaming “call out culture” and “a simplistic, unworkable, and ultimately stifling conception of social justice”. 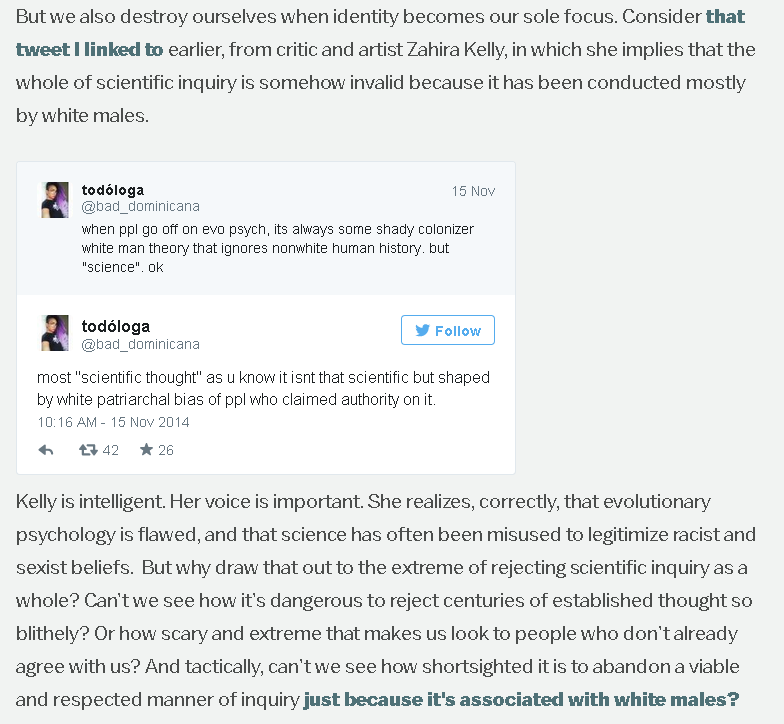 In an article whose subject is, I remind you, “my students scare me”, he chooses to highlight a couple of tweets by blogger @bad_dominicana, Zahira Kelly, talking about bias in science. Note that Zahira Kelly is not one of his students. Zahira Kelly is not one of his colleagues. Zahira Kelly has bother-all to do with him or his. What Zahira Kelly is to him is a convenient target of opportunity, a person who can be used as both a scapegoat and a lightning rod. I have the feeling that Schlosser knows none of his students would actually be that scary to the Vox.com reading audience. I’m sure he knows that it’s hard to sell his fear describing them in the abstract. But what is scary to his audience? But an outspoken AfroLatina blogger, a self-described “Bad Dominicana” speaking her unvarnished thoughts in Tweet form? Kelly is not one of his undergrads, but let’s stop and marvel at the condescending manner with which he acts as though she is, as he praises her intelligence and voice while blowing past her point to work what she said into what he was saying, in more or less exactly the same way he describes dealing with off-track interjections into his class. Except she didn’t interject. He went looking for her saying something, and then even though it’s not germane to his topic, he roped her into his article, held her up for the world as an oh-so-frightening example of why everybody else should be as scared as he is. And except she’s not saying what he claims she is. If she were calling for us to reject science, why would she say that most (quotation marks hers) “scientific thought” isn’t that scientific? If the point was science is bad, she wouldn’t be arguing that anything isn’t science. She would have no reason to make that distinction. And look at the phenomenal leap he makes from her calling out “white patriarchal bias” to saying she throws things out “just because it’s associated with white males”. Maybe I have a low tolerance for or high sensitivity towards this particular leap because of how often it comes up in dealing with Sad Puppies, but really. Someone who claims he just wants to go back to a time when nuance and complexity and reason were allowed to rule over short-sighted oversimplifications and us-vs-them identity arguments should not be mistaking a conversation about bias for one about demographics. That’s inexcusable. But at the risk of giving him an “AHA!” moment in support of his supposition that feels have superseded reals, I have to say that the fact that he’s wrong in the sense of being incorrect in his words is really secondary here to the fact that he is wrong in the sense of being morally indefensible in his actions. Because whatever he’s using Bad Dominicana’s words to say, the fact is, he’s using her. He knows—or at least has no business not knowing, given that he’s mining her Twitter timeline for pull quotes—that her writing makes her a target for abusive backlashes. He must know that there’s a receptive audience out there looking for acceptable targets to pile onto and an excuse to pile on them. His piece is one of many out there right now that are full of hand-wringing and head-shaking over the plights of the poor, beleagured Joss Whedons and George R.R. Martins of the world, a world in which apparently anyone can just say anything to anyone else and it’s supposed to be okay. Cultural critics, activists, and bloggers like Zahira Kelly are routinely held up as being the face and muscle of an unstoppable juggernaut that lashes out without warning and strikes without repercussions. This ignores the actual realities of online discourse. What power the internet has as an equalizer means that stuff can fly in every direction at once. As Joss Whedon got full blast the rage of angry/disappointed comic fans, internet trolls, and those labeled as “Social Justice Warriors”, there were people taking full advantage of the opportunity to lay blame for both that whole fustercluck and Joss’s decision to leave Twitter at the feet of feminists. And always, always, these attacks somehow spiral out and grab hold of people who have nothing to do with them. It’s opportunism. At WisCon 39, on the panel at call-out culture, we discussed this tendency as it has shown up on Tumblr: somebody finds themselves involved in an argument or controversy (or wants to find themselves there); they pull in someone they know has a dedicated hate-following. The target of such a proxy attack is inevitably stereotyped as either “strong” or “thriving on attention”, or both, and thus immune to pain and in no need of empathy. It’s incitement, it’s exploitation, and it is abuse. We should not stand for it. Folks, it is downright eerie how many people are trying to leave comments on this post and either clearly haven’t read it, or read it and assumed that I’m saying “Edward Schlosser is wrong, wrong, wrong about his premise and I’m going to nitpick the way he treated an unrelated third party purely as a means of attacking his message,” as though it’s impossible for me to actually care about the subject I’m actually talking about. The latest offender asked me if I’m in academia (a question this post answered!) and then dropped a link to her own blog post in support of his point. I treated this like spam. I’ve been telling people all week that if they want to debate Schlosser’s larger point, they should do so in their space. That’s not an invitation to use my space as a billboard. If you want to comment on this piece, make sure you’ve read it and know what it’s actually about.